The Incredible Suit: Happy 100th birthday you little tramp! It's exactly one hundred years today since Charlie Chaplin's insanely successful 'Little Tramp' character made his debut on cinema screens, so to celebrate this momentous landmark date I've spared no expense, pulled out all the stops and written a short blog post about it. 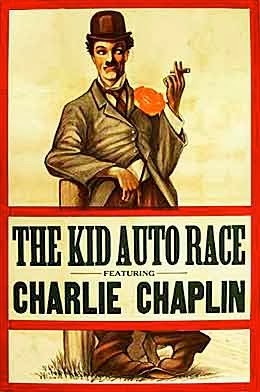 The snappily-titled Kid Auto Races At Venice, California probably isn't regarded as comedy gold by many these days (although it's still funnier than either of the Anchorman films), but its importance can't be misunderestimated. At just six minutes long, it's more of an extended sketch than a short film, but it's one of the first examples of a comedian recruiting an oblivious public into his act by being unfathomably annoying in order to provoke a reaction. 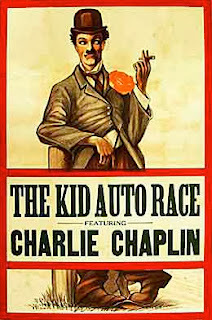 This was also the very first time the general public had seen Chaplin's Little Tramp (not a euphemism), and the short provides an excellent opportunity to see history in the making: their reactions, shifting from bafflement to amusement, would be echoed in cinemas around the world for the next century. So dig out a hundred candles, inadvertently set fire to your bottom or something and enjoy a slice of cinema history. And if you come away underwhelmed, go and watch The Rink afterwards to see what Chaplin could do when his director wasn't trying to choke him. Further, excellent reading: this piece by Silent London's Pamela Hutchinson.